The above image is resized to one half of the Nikon Coolpix 990 camera resolution and cropped to 528 x 768 pixels. Complete moon view at 18 Days 9 Hours old. 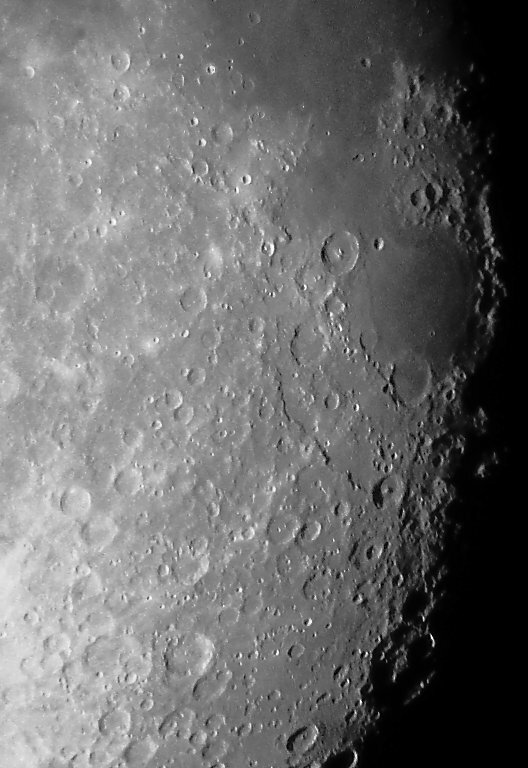 Mare Tranquillitatis is top center. Mare Nectaris is in the center. Theophilus crater is at the 10 O'clock position on the edge of Mare Nectaris. Sinus Asperitat is connects Mare Tranquillitatis to Mare Nectaris. A Tycho ray extends from the lower left corner up to the lower left edge of Mare Nectaris. Craters as small as 6.5 km (Moltke) are easily seen on this image. Mountain range Rupes Altai is in the center of the image and runs diagonally across the Tycho ray. Nikon Coolpix 990 Digital Camera afocal coupled to a ScopeTronix, Inc. STWA18 Wide Angle 18mm Eyepiece/Adapter with a Tele Vue 2X Barlow on an Orion Telescopes & Binoculars ShortTube achromatic 80mm aperture refractor, f/5 focal ratio, 400 mm focal length (800 mm focal length with 2X Barlow).